Portrait of Sequoyah courtesy Wikipedia. 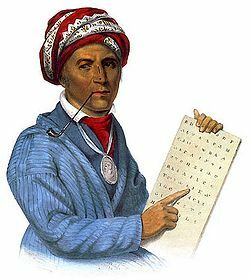 Sequoyah was a Cherokee silversmith who created an alphabet and syllabary for the Cherokee nation. Noticing the effectiveness of the “talking leaf” (pages of writing) used by the pale skins, he divined that his people needed a similar written system to communicate. During twelve years of labor and study he completed a syllabary of 85 symbols representing the sounds in Cherokee spoken language. Sequoyah’s achievement is all the more remarkable in that he did not know any written language — was illiterate — when he embarked on this project. The syllabary that Sequoyah developed enabled the Indian nation to attain literacy in their spoken language. The Sequoyah League in California was founded to improve conditions for First Peoples. *Foreman, Grant, ”Sequoyah”, University of Oklahoma Press, Norman,OK, 1938.